a lovely nursery rhyme that is both fun and useful as a counting song to choose who's going to start first in a certain activity. 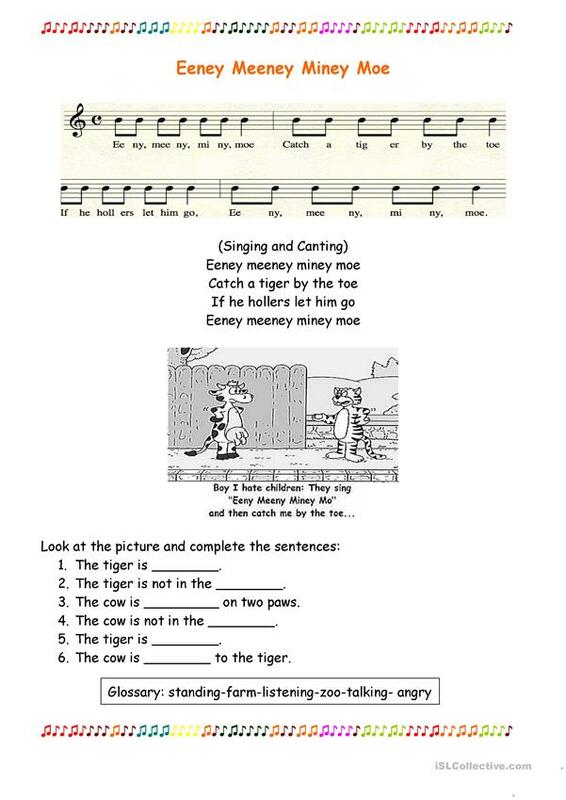 exercise with simple vocabulary is created aside to a picture that would help understanding the song better. Relavant especially after the release of Justin Bieber's Eeniw Meenie new version of the song! The present downloadable teaching material was created for elementary school students at Beginner (pre-A1) and Elementary (A1) level. It is valuable for consolidating Verb phrase in English, and can be used for enhancing your class' Listening, Reading and Writing skills. It features the theme of Animals. Rmrm is from/lives in Israel and has been a member of iSLCollective since 2011-08-15 21:49:25. Rmrm last logged in on 2019-04-05 10:53:26, and has shared 6 resources on iSLCollective so far.